In 1933, Joseph Rosenfield had the nutty idea to change the formula for peanut butter. 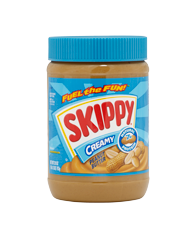 He created SKIPPY® peanut butter, which was less sticky and longer-lasting. Peanut butter lovers fell in love, and spread the fun to their families and friends. Fifty years after Joseph Rosenfield’s innovation, SKIPPY® peanut butter wowed peanut butter lovers again with SKIPPY® Natural peanut butter, the first no-stir natural peanut butter spread. This new spread was a revelation in nutty goodness—all the flavor with fewer ingredients and less mess. SKIPPY® peanut butter is still the choice for peanut butter lovers, filling lunch boxes, picnic baskets and kitchen tables everywhere. For more information on SKIPPY® peanut butter, visit the SKIPPY® peanut butter website.